(Reuters) - Gold moved slightly higher on Tuesday, supported by uncertainties surrounding U.S.-China trade relations ahead of President Donald Trump's State of the Union address to the Congress, while a firmer dollar and rising global stock markets capped gains. Spot gold edged up 0.2 percent to $1,313.98 per ounce by 12:22 p.m. EST (1722 GMT) after hitting its weakest since Jan. 29 at $1,308.20 in the previous session. U.S. gold futures were down 0.1 percent at $1,318.20 an ounce. "We have the State of the Union address and we are still waiting for more hard data on trade talks," said David Meger, director of metals trading at High Ridge Futures. "There are still political concerns which remain and that probably adds to support for gold, along with the dovish U.S. Federal Reserve." 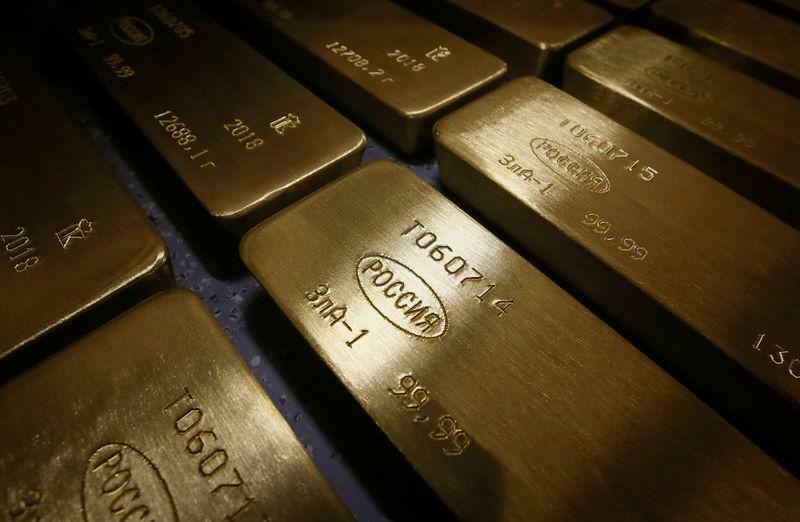 Gold last week rose to its highest since late April at $1,326.30, after the U.S. central bank kept interest rates steady and said it would be patient on further hikes amid a cloudy outlook for the economy due to global growth concerns and the U.S.-China trade dispute. Solid U.S. jobs data since then, however, has allayed concerns of an immediate slowdown in the U.S. economy. The central bank may need to raise U.S. interest rates a bit further if the economy does well, Cleveland Fed President Loretta Mester said on Monday. Gold tends to fall out of favor when interest rates rise. World stock markets extended their robust start to the year, making non-yielding bullion a less-attractive investment, while the dollar, which is at a more than one-week high, was on course for a fourth straight session of gains. Investors are awaiting Trump's address due at 9 p.m. EST on Tuesday for some clarity on U.S.-China trade relations and a political logjam over the construction of a wall along the country's border with neighboring Mexico. On the technical front, Monday's dip to a near one-week low reflected that some investors are "coming into the (gold) market now before it takes off any higher," said Michael Matousek, head trader at U.S. Global Investors. The overall outlook for bullion remains positive, analysts said. "Further market turbulence and confrontational politics could keep gold in investors' sights," Heraeus Precious Metals said in a client note. "Gold is expected to trade in a range between $1,225/oz and $1,450/oz, with the outlook broadly for further upside, though no doubt with some pull-backs along the way," it said. Among other precious metals, palladium gained about 0.4 percent to $1,370 per ounce. Silver was down 0.2 percent at $15.83 per ounce and platinum dipped 0.4 percent to $814.61.